In the first days, in the first weeks, mom and dad would like to have their baby always next door. During the night this necessity becomes even more intense: above all mother needs to feel the child beside her, to nourish, care for and watch over him. But even the newborn calms down feeling the presence and the closeness of the mother, feels secure and immediately receives satisfaction of his needs. 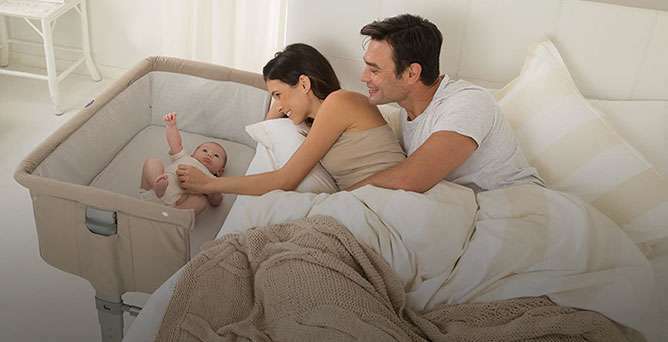 Today experts believe that this closeness is positive, not only for the tranquility of the parents but also for the correct growth of the child who regulates his biological rhythms with those of his parents. Furthermore, according to recent studies, the child who sleeps in the same room as the parents but not in the Latvian runs less risk of incurring SIDS, the sudden infant death syndrome. In light of all this, there are few mothers who bring the baby to sleep close to them, often carrying it in their bed, also to avoid having to get up at night for frequent feedings and awakening. But letting the child sleep in the Latvian is completely discouraged because it is not safe for the little one! For a newborn, the heat that develops under the covers in the presence of adults could be excessive and therefore dangerous. Also during sleep it is possible that mum can get too close to the baby, with a real risk of accidental suffocation. It is therefore recommended to let the child sleep in the room with the parents but not in their bed. Better to use a cradle to be placed next to the bed where the child can rest safely in a space of his own, close to the mother but in complete safety. For a truly serene sleep. This entry was posted in Relax & Playtime, Sleep Time. Bookmark the permalink.